Climate Control is a full-service Heating, Ventilation and Air Conditioning (HVAC) contractor. We specialize in residential & small commercial installations, service and maintenance. Our mission is to provide the Greater City of Sudbury with optimum quality service and customer satisfaction regarding every aspect of our business activities. Climate Control has been heating and cooling the Greater City of Sudbury for more than 7 years. Our team of fully licensed technicians provides professional service to ensure that your heating and cooling systems are functioning properly. Our extensive knowledge in specialty hot water heating systems, radiant in-floor, air conditioning, ductless air conditioning, fireplaces, as well as conventional and high-efficiency boilers and furnaces, results in unsurpassed comfort. We install top quality equipment by manufacturers such as KeepRite, Viessman, Buderus, Venmar, Rinnai, Continental Fireplaces, among many other makes and models of your choice. Quality, integrity and reliability at the right price. We are a Service-Driven company! We are available to help you resolve any issues you may have with your existing furnace or air conditioning system. Highly qualified technicians are trained to offer exceptional service. Our maintenance and repair service team strives to provide your HVAC system with operational excellence. Call us for any emergency support 24 hours a day, 7 days a week at 705-207-1320. We offer FREE in-home quotations aimed at providing you with satisfying home comfort solutions. Check out our website regularly for special offers, along with news and updates in today’s fast-changing HVAC industry. At Climate Control, our customers’ needs are our first priority. We offer 100 percent satisfaction guarantee! We are a registered member of the Technical Standards and Safety Association (#000076641791). And we are an authorized contractor for the Ontario Electrical Safety Authority. 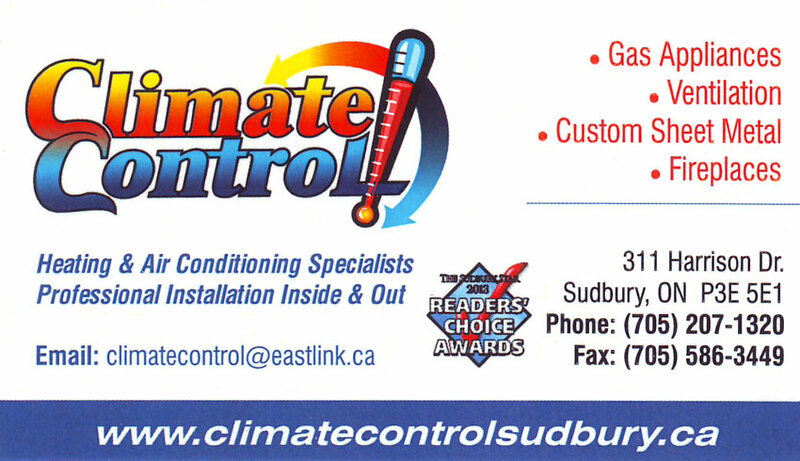 Climate Control, Air Conditioning Contractors, New & Used Boilers, Fireplaces, Furnaces, Heating Contractors, Propane Gas Sales & Service, Sheet Metal Work, Water Heater Dealers, in Sudbury, Ontario.